Step back in time on a visa-free port-of-call visit to Russia's 'Venice of the North,' with two days of leisurely touring that's ideal for those who like a little down time and a relaxed pace. 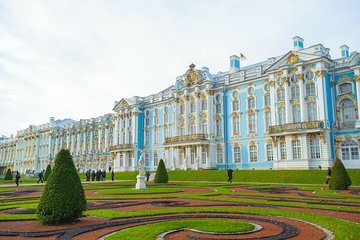 Experience some of St Petersburg's top sights and attractions, which depending on the time of year may include a hydrofoil excursion to the stunning Peterhof fountains, Catherine Palace and its exquisite Amber Room, the Hermitage―one of the largest museums on the planet―and the onion-domed Church of the Saviour on Spilled Blood. The two days we visited were on/off rain, and yet it was a fantastic trip. We were picked up at the cruise terminal efficiently and introduced to our guide, Svetlana. She was a fabulous guide who knew every aspect of history, art, culture of the city and the sites we visited. She even took us for a ride on the Metro, just to give us some insight into the everyday life of people in St. Petersburg. The sites we visited, Peterhof, Catherine's Palace, the Hermitage, the Church on Spilled Blood, the Peter and Paul fortress and church, and other lesser sites, were stunning each in their own way. We were driven around on a very modern, comfortable mini-coach. We recommend this tour without reservation. SPB tours were superb. Well organised, informative and made the maximum use of the available time. If you tried to do this independently you would be doing yourself down. The best experience and value for money on my 14 day cruise of the Baltic sea. The tour, what we got was ok. My problem is, we chose this tour because it included the Hermitage Museum. We were scheduled to visit the museum on the second day of our tour. We were on the bus leaving the cruise terminal when we were notified that we did not have tickets to the museum. It was explained that they request tickets months in advance, and because of large demand during that time they were denied tickets. I purposely booked with SPB Tours because of their size and reputation. If they requested tickets months in advance, then they should have had advance notice of not granted tickets. Why then didn't we get advance notice that the museum would not be included in the tour ??? If we had known before we left on the tour we would have demanded our money back. We were extremely disappointed along with every one else on our bus. To wait until they have you captive on the bus not being able to bail out was very deceptive and unprofessional. The first day of the tour we stopped for lunch. The restaurant had no atmosphere and we were in a back room. The waitress spoke only Russian couldn't explain the menu in Russian and could not give us separate bills, someone on the tour at our table paid in cash because the credit card machine would not work and we had to figure out what we owed him trying to calculate USD to Rupples. Second day restaurant was a little better, still no help in ordering food. On our other ports of call tours, lunch was included. I would not recommend this tour agency to anyone. Our driver Sergei was great, but I and others in the group were very disappointed in our guide, Lena S.
There were multiple times when we were told to just meet her outside- she did not say WHERE outside- they were very large squares. She also did not give specific times for us to meet afterward, so the tour got way behind schedule on May 9. Then we had to rush through Catherine's Palace to make up the time. The same thing happened at the end of the second day at Peter and Paul Fortress. Our hydrofoil ride was supposed to be at 10AM. We did not get on the hydrofoil until approximately 10:40, because we could not get to it- the bridge and many roads were closed for Victory Day. This should have been anticipated, and arrangements made for us to get to the hydrofoil efficiently. Instead, Lena had us walk to 3 different locations before we were finally allowed access to the road where the hydrofoil was. On May 10, the guide was unable to reach driver Sergei by phone after our tour of the Hermitage- she didn't know where he was. She should have set up a specific place and an exact time for him to pick us up. Once again, everything was disorganized. She was finally able to reach him and we walked to bus the tour schedule said lunch would be next, at 12:30. Lena asked us if we wanted to eat before going to the Church of Spilled Blood. Several of us said that we wanted to eat first- that was what was on the schedule, and it was already 12:30. Then a few minutes later she announced that SHE had decided we would go to the church first! We did not eat lunch until after 2PM! 5 hours into a 7 hour tour.We did not understand why she asked us what our preference was, and then decided on her own to do the opposite. The tour description said 1 we would go to a farmer's market. We went to a souvenir shop 2 we would visit the Metro. We did not. 3 this tour provided a more relaxed experience. It was not. INTERESTING TOUR. JANE, TOUR GUIDE WAS PROFESSIONAL AND KNOWLEDGEABLE. SHE WENT OUT OF HER WAY TO ENSURE THAT EVERYONE ENJOYED THE TWO DAY TOUR. JANE PROVIDED US WITH DETAILED INFORMATION ABOUT THE PLACES THAT WE VISITED. JANE and SERGEI, THE DRIVER WERE A GOOD PAIR. THEY WERE PUNCTUAL ON BOTH DAYS AND ASSISTED US PASSENGERS WHEN REQUIRED.I HIGHLY RECOMMEND THIS 2 DAY TOUR AS IT IS VERY INTERESTING, BUT BE WARNED!, VERY TIRING, LOTS OF WALKING, A LOT TO SEE IN TWO DAYS. IS IT POSSIBLE TO HAVE THE PARK TRAIN INCLUDED IN THE PACKAGE/TOUR AROUND THE LOVELY PARK WHERE THE STATUE OF SAMSON/WATERFALL ETC IS LOCATED AS IT IS AN EXTENSIVE AREA AND I WOULD HAVE ENJOYED IT MORE IF WE HAD THE OPTION OF AN ON/OFF TRIP AROUND THE BEAUTIFUL PARK.THANKS. SPB provided a clean and comfortable ride for a small group of 9. the tour guide was good but could be more informative as we rode along the way. the 2 days tour covered mostly of 5 places: Perterhof fountain is good, garden is not, Catherine palace good, the Hermitage good, but not as good as the Louvre, the Church of spilled blood and Peter and Paul Cathedral fortress was not tour. Many tour activities can be improved 1st day lunch, boat ride waiting or skipped Metro, 1st day shop, river bank. I wished it covers more common historical places such as market, square, parks, etc.